What's the best news you've ever heard? Fresh new look guest Handbook for this popular and faithful introduction to the Christian faith. A highly effective way to help unbelieving friends consider the claims of Christ for themselves...showing respect and consideration for honest doubts and questions. This is an outstanding resource to help ordinary Christians in ordinary churches commend the gospel of the Lord Jesus to others, and this revision makes it even better. 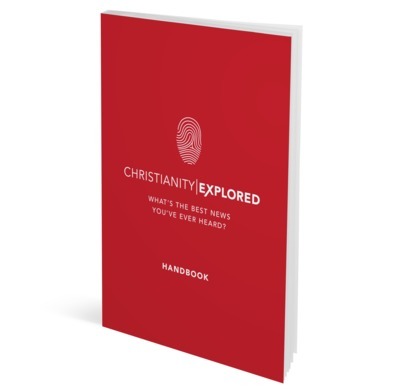 Christianity Explored is an excellent resource and I warmly recommend it. The Leader's Guide is a treasure trove of experienced advice, the beautifully produced DVD takes us through the claims of Jesus as recorded in Mark's Gospel, and Rico Tice is one of the most engaging evangelists in the world today. I ran my first CE course around 10 years ago and was impressed then. Now using this latest material for the first time and it's wonderful to see people engaging with the message and thrust of Mark's Gospel on Jesus' identity, mission and call. Not yet finished this current course but there is a big spread of ages and everyone is very well-engaged. I highly recommend this handbook - such a well thought-out resource. Prompt delivery in very good packaging. An excellent resource for guiding someone who is searching for answers to faith in Jesus Christ. Have used TGBC several times in the past, but this was the first time for a download purchase. Very easy and quick, great website. Nothing needs to be said about the course - still one of the best out there. I cannot rate this course highly enough. We have used it for a number of years and will continue to; a very clear, full and engaging presentation of the gospel. We will continue to run this course regularly--it is life changing. This product contains a lot of extras which you can access online including the videos which is very helpful. There are a lot of resources and gives one the confidence to get started. Excellent material, perfect shipping. Handy, great graphics. Excellent tool to help us engage with Christians and non-Christians. I'm on my second session with my atheist friend, and he loves interacting with the CE course. Thank you the Good Book Company for providing this life-changing material. All the materials I sent for (handbooks and Mark's gospels) were delivered to me promptly, within a few days, and I was delighted with the service. Thank you very much.